Students will learn about the role of preservation in architecture, the community, and the local economy. Students will learn to articulate their views on preservation and create planning boards. Adaptive re-use (noun): to take an existing building that had one purpose and renovate it to be used for a different purpose. Demolish (verb): to knock down a building. Dilapidation (noun): the natural deterioration of a building due to neglect. Historic (adjective): referring to an example from the past. Preservation (noun): protection from harm and/or damage. Restoration (noun): the act of returning a building to its original condition. 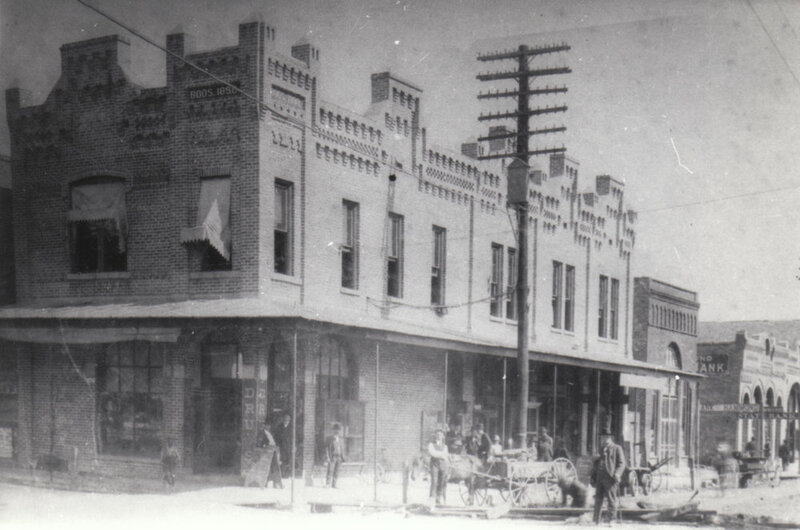 Images of Downtown Hammond from the past to the present. 1. What makes buildings or neighborhoods “historic” and therefore worth preserving? This can be a complicated question, but in simple terms, historic preservation is essentially about saving and maintaining old buildings and places because they have value to us today, in one way or another. - In some cases, old buildings may be aesthetically pleasing to look at and therefore provide visual enhancement to an area. - Old buildings are worth preserving if they have sound structure and can be adapted to a new use. This is known as “adaptive re-use” and is a form of recycling, avoiding unnecessary demolition and new construction. This con- tributes to a reduction in land ll use and therefore aids in preserving the environment. - In other cases, old buildings have played an important role in history and are worth preserving because they provide a link to the past or to some historical event. They provide a place for people to visit, remember and learn about their history. In some instances, it may be appropriate to restore these buildings to their original condition, perhaps to serve as a museum. Their value may be as a record of a historic architectural style, of which there are few remaining examples. 2. What should we preserve? Any kind of building, from factories to mansions, can be considered worth preserving, as can any size or scale of building, structure or neighborhood. 3. What are the advantages of historic preservation? - character through their variety of styles and texture of materials. - more economical than demolishing them and constructing new buildings. - Successful historic preservations can often draw visitors to an area, enhancing tourism and contributing to the local economy. - Historic places inform communities about their roots and their past. They also can be a means of passing memories from one generation to the next. 1. Show students images of Hammond’s Main Street, ask them what they like about the main street and explain the Hammond Historic District Commission’s role in maintaining that for the community. 2. Distribute handout about John Desmond and Modernism in Hammond. Ask students what they think needs to be preserved for future generations in Hammond. 4. The “Old Town Streetscape” is in the process of being redeveloped, and the planning board has to make a decision for each building about whether it should be demolished for new development, preserved and restored as a museum, preserved for “adaptive re-use,” or preserved for its architectural or historical significance. Have the students on each planning board come to a consensus about each building’s fate, and giving their reason(s), have a member from each group present their group’s decision to the class. Ask students to determine the condition, character defining features (what makes a building special), alternative use, and to come up with alternatives to demolition. Sample applications to the Hammond Historic Districts Commission will be provided. 5. Ask each student to submit a writing response about how historic preservation impacts Hammond. Ask students to write about and analyze which buildings in Hammond they believe deserve to be preserved. 1. Evaluate the student’s planning board decisions and note their differences considering the viability of the conclusions. 2. Evaluate the student’s ability to describe in writing how preservation relates to Hammond.